About : www.no-junk-mail.co.uk - THE NEED TO SAY "NO"
Welcome to this No Junk Mail website. Our aims are very simple, to reduce and stop unwanted Junk Mail coming through our doors, We don't ask for it...so why do they post it. Lets Say "No" to Junk Mail. Our simple sticker on your letterbox/door will reduce this Junk Mail. The Junk Mail delivery people respect our sign and simply skip your door. 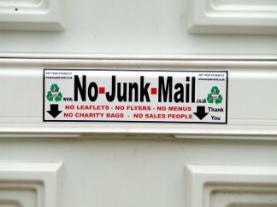 It is estimated that up to 90% less Junk Mail will be posted through your doors displaying our sign. We are currently testing this theory at two identical homes in a highly populated student area in the UK, which has a very high rate of Junk Mail, These houses are next to each other with one displaying our logo and sign and one not. These results will be posted on here after three months and allowing for the bombardment of menu's and flyer's in the student area when their next academic year starts in September. The Above Image Was Taken On The Test Subject Address, Clearly Displayed On The Letterbox Of The Property. 2 Local Menu's, 2 Local Community Newsletters, 1 Charity Bag, And A Local Government Letter About A Recent Local Planning Application. In January 2011, My home was bombarded with junk mail, from Slimming Groups, Joining A Gym, to the my all time favourate, The Takeaway Menu. We all maybe partial to a take-out once in a while, but we all have our favorates anyway. If Not There's always www.justeat.co.uk, which is a convienient way to locally order food safely and securely . A few days and and several designs, The size of an average letterbox, the wording, the name of this website, The laws of selling door to door, Well long story short......We Now have this sticker and this website. What Next....Lauch the Sticker,Market The Sticker..My Plan with our campagn is to have our sticker a nationally recognised Sign...Just Like The "No Smoking" Sign..My Sticker although supported by many Organisations and Councils will contain NO ADVERTISING. I do not want a canvasser to see a sign or logo for a TV Show / Radio station before they read the words NO-JUNK-MAIL. It was designed to be a clear and simple message to stop JUNK MAIL and encourage Recycling. As small as it is......IT WORKS......I cannot guarantee 100% but by nationally promoting and making canvassing businesses aware that you do not wish the intrusion at your home will gradually increase this percentage and make this a nationally recognised Sign. A sign for the future and preserving our future by reducing JUNK MAIL and our global footprint on the planet. If we don't want it, they don't need to Print It / Deliver It. So if they don't put it in your letterbox, in can go in the next one without a sticker, Who may want. The More STICKERS we sell the Less they produce. Please see The No-Junk-Mail Campaign 2012 For Our plans for 2012. I would like to say that David Cameron will put a STICKER on Number 10, or a big letterbox on the gates of Buckingham Palace, with our sticker on, but I am still awaiting their reply's...Will keep you updated though. It is now down to Time, Money & Effort to get This Message across. We aim to bring you a lot of support and information through this site to reduce your JUNK MAIL issues, from third parties beyond our control. The sale of stickers will fund this service or you can personally donate to the site by clicking on the donate button above. There are many issues and laws and red tape that govern, I will say "JUNK MAIL" The Dictionary definition is (noun) " Untargeted mail, adverising goods or services". "If We Didn't Ask For It, Want It... Its "Junk Mail"
This will be me, a letter, an email, a poster, another sticker a week until the industry takes notice of our sticker / sign and allows us to have the choice. Please note my tunneling days are over, but I am a keen enthusiast of the Williamson Tunnels - "The Mole Of Edge Hill", Where when not fighting this campaign, I am digging and helping theirs. (Click The Link To See) This is an amazing story and a piece of history in the Northwest, Well Worth A Look.